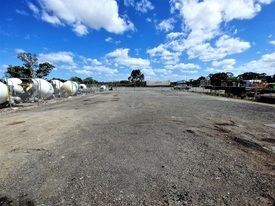 54 Commercial Real Estate & Properties in Murarrie are listed in 5 categories. We have 33 Industrial Warehouses Sale & Lease , 14 OfficesSale & Lease , 5 Other Commercial PropertiesSale & Lease , 3 Development LandsSale & Lease and 1 Retail ShopsSale & Lease . 678sqm attractive front left corner unit 233sqm tilt panel warehouse with electric container height roller door, 6.8m internal height 445sqm a/c office featuring ground floor showroom office space, plus mezzanine level partitioned offices, boardroom, open plan area, data cabled, alarm system, fresh carpet and paint throughout Amenities include a staff lunch room, multiple bathroom facilities on each floor and a shower 9 exclusive use car spaces plus visitor street parking available Front unit offering terrific signage opportunity Easy access to Gateway Motorway, Port of Brisbane, Brisbane CBD Brisbane Airport Available 1st February 2020 Lease: $77,970p.a. + Outgoings + GST ( Approx) For further information please contact Jared Doyle or Jack Gwyn of Ray White Commercial TradeCoast! Price Reduction - 217m2* Murarrie Industrial Unit With Rear Yard $625,000 + GST (if applic.. Located in the Bridgemark Centre in the well established and sought after commercial precinct of Murarrie in Brisbane's Southern TradeCoast region is this great quality property, featuring: 153m2 of warehouse floor space, electric container height roller door, rear roller door, secure cage area, three phase power Additional 50m2 mezzanine (not included in building area) with 600kg/m2 load rating, a/c enclosed workshop on the mezzanine 80m2 fully fenced, concrete hardstand area at the rear of the property 64m2 mezzanine level, a/c office space with multiple partitioned offices Amenities include a kitchenette and bathroom with a shower Three exclusive use car spaces including 2 under cover plus ample additional parking on site Sale Price: $625,000 + GST ( approx) Contact Exclusive Agents Jared Doyle or Jack Gwyn of Raywhite Commercial TradeCoast today! 55m² Office / Retail space Close proximity to Murarrie Train Station Signage Exposure opportunities Open plan layout with small partitioned area at the rear with kitchenette provisions Join other tenants such as Locco Espresso, Curly's Hairdresser, Gateway Snack Bar Murarrie News Agency Affordable retail space in an area with very little supply approximate only Contact the Ray White Commercial marketing agents to learn more about this property to arrange an inspection. 263sqm office / warehouse in the highly sought after Rivergate Marina complex 198sqm warehouse showroom area, 3 phase power 65sqm first floor air conditioned, carpeted office Rear electric container height roller door accessing the Marina hardstand Front vertical bi fold door accessing the driveway 3 exclusive use car spaces plus visitor parking throughout the complex Amenities include a kitchenette disabled size bathroom with a shower Suitable for both Marine Non Marine based businesses Close proximity to the Gateway and Port of Brisbane Motorway Sale Price: $660,000 + GST ( approx.) Please contact Exclusive Agents Jared Doyle or Jack Gwyn of Ray White Commercial TradeCoast! Abundance Of Natural Light | Fully Furnished | Central Location $1151pw | 18 Person Works..
PROPERTY OVERVIEW $1151pw Price incl. Large modern office unit with warehouse and storage space for rent in the Trade Coast region, just 11km from Brisbane CBD. This professional Murarrie office space delivers a premium and corporate office environment with oodles of space, style and storage. Over two floors, it comprises 5x 1 person offices, 5x coworking desks and a 20 seater training room (or alternatively 8 more workstations), plus a smart boardroom, conference area, kitchen, storage and a large warehouse space. The contemporary office sublet provides heaps of potential for a business that needs more room, whether you rent the whole unit or just one floor ( 7 or 11 workspaces each) while sharing the communal spaces, storage facilities and meeting rooms. With fast internet, printing equipment and ducted air con, this Murarrie office lease is all set up to move into quickly! Add the smart finishes, modern furniture and great natural light and get ready for your team to be inspired all over again. Enquire today to find out more and book a tour of this fantastic office sublease in the Australia Trade Coast Region in East Brisbane. 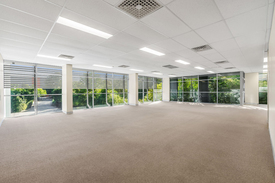 This impressive office unit sits in a top quality corporate building in an upmarket area of the Australia TradeCoast Region. Perched on the corner of State Route 20 and Miller Street, it benefits from great exposure to the busy Creek Road and is both easy to find and highly recognisable.The office spaces are spread over two levels with the large warehouse space on the ground floor and there is plenty of car parking on site to ease your parking woes. This sought after location places you in the heart of the Australia Trade Coast with excellent proximity to the Gateway System and easy access to Brisbane CBD. If you’re looking for office space and much much more in East Brisbane, don’t miss out on this exclusive rental opportunity. The advertised office space is perfect for a team of 18. If you need more or less space, we have over 30,000 furnished workspaces all over the world suitable for a team of 1 to 200+. Our award winning team offer a free service that will help you find the perfect solution for your needs, so reach out if you need more help. What you get for your weekly rent , 24/7 Access , Access to internal breakout areas , Access to kitchen facilities , Access to secure printer and scanner , Building outgoings included , Electricity usage included , Flexible terms , FREE use of the meeting rooms , Plug and play furnished workspace , Private lockable office , Regular cleaning , Secure high speed Internet Building features , Abundance of natural light , Air conditioning , Car parking in building (Free) , Open plan layout , Print, scan and copy facilities , Professional working environment , Retail and shopping malls nearby , Taxi / Uber stand close to building 11km to Brisbane CBD 2.2km to Murarrie Recreation Ground 1.5km to Cannon Hill station Large storage areas. Who is Office Hub? Office Hub is the world\'s No.1 marketplace for office space. We have a huge global selection of coworking spaces, serviced offices and shared office spaces with flexible options to suit teams from 1 200 people. We\'ll take you on a tour of all the workspaces that fit your needs and work on your behalf to get the best price possible. We\'ll help you discover how shared office space can be the most beneficial and budget friendly solution for your business. www.office hub.com Conditions apply – the advertised price includes any incentives offered based on a 12 month agreement and is available to new tenants only. Please note that the rental rate may increase for a shorter rental period. A portion of the square meterage factors in access to shared space. 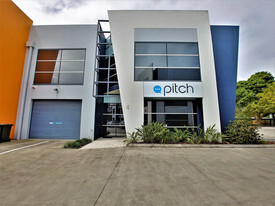 1,387sqm 1,855sqm high calibre TradeCoast office/warehouse 293sqm 761sqm exceptionally fitted out office space (239sqm majority open plan ground floor showroom/office 468sqm first floor executive office fitted out with multiple offices/ board rooms) 1,094sqm well insulated, high bay warehouse with fantastic natural light Ample 3 phase power Pallet racking included Amenities on each level Dual electric container height roller doors Ample onsite parking Large concrete apron (ideal for container truck maneuvering) Fully fenced site Well positioned Southern TradeCoast location being close to the Gateway Motorway, Port of Brisbane Brisbane Airport Available Now!! ( approx.) For further information or to arrange an inspection please contact the marketing agents Jared Doyle or Jack Gwyn of Ray White Commercial TradeCoast! 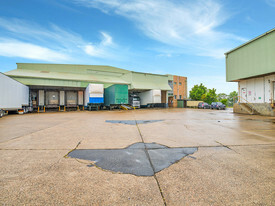 1,682sqm* Cheap Storage/ Warehouse $117,740 p/a + Outgoings ..
1,682sqm warehouse 4 loading docks sheltered by a large all weather awning 1 fork ramp with roller door 3 phase power Large concrete apron in front of building Arguably the best value in Murarrie Fantastic location being just 600m from the Gateway Motorway Port of Brisbane Motorway and just 150m from the Murarrie Train Station. PRICE : $117,740 p/a + Outgoings + GST ( approx.) For further information or to arrange an inspection please contact the exclusive marketing agents from Ray White Commercial TradeCoast. 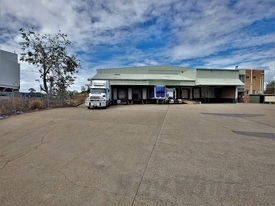 1,227sqm office/warehouse 28sqm office 1,199sqm warehouse 3 loading docks 1 fork ramp Multiple office/warehouse tenancies available Ample 3 phase power Multiple container set down areas can be included Amenities with each tenancy Arguably the best value in Murarrie Fantastic location being just 600m from the Gateway Motorway Port of Brisbane Motorway and just 150m from the Murarrie Train Station. PRICE : $85,890 p/a + Outgoings + GST ( approx.) For further information or to arrange an inspection please contact the exclusive marketing agents from Colliers International or Ray White Commercial TradeCoast. 2,269sqm* Tradecoast Distribution / Storage Facility $140,840 p/a + Outgoings ..
2,269sqm office/ warehouse 84sqm office 2,185sqm warehouse 188sqm concrete hardstand/ container set down area 2 loading docks 1 on grade electric container height roller door Ample 3 phase power Multiple container set down areas can be included Amenities with each tenancy Arguably the best value in Murarrie Fantastic location being just 600m from the Gateway Motorway Port of Brisbane Motorway and just 150m from the Murarrie Train Station. PRICE : $140,840 p/a + Outgoings + GST ( approx.) For further information or to arrange an inspection please contact the exclusive marketing agents from Colliers International or Ray White Commercial TradeCoast. 200m2 high bay warehouse with electric container height roller door and 3 phase power 81m2 carpeted mezzanine level office, ducted air conditioning, great natural light Amenities include kitchenette and disabled size toilet, opposite local Carvery Truck access via dual crossovers, huge concrete apron, Murarrie Road is B double approved Two exclusive use covered car spaces plus ample visitor bays on site Close to the Gateway Motorway, handy to Brisbane Airport, opposite Murarrie Train Station Available Now call joint Exclusive Agent for an inspection! Lease: $43,555pa + Outgoings + GST ( approx) Contact joint Exclusive Agents Jared Doyle or Jack Gwyn of Ray White Commercial TradeCoast! 1326sqm* Metroplex Murarrie Office / Warehouse $179,000pa + Outgoings + ..
1961m2* High Quality Murarrie Office / Warehouse $313,760pa + Outgoings + .. Located in the Metroplex on Gateway business estate in Murarrie this property has been fully refurbished to the highest standard. Features include: 534m2 of a/c office or showroom over two levels (218m2 on ground with 316m2 above), open plan with fabulous natural light throughout 1267m2 high bay clear span warehouse with 4 container height electric roller doors 160m2 additional office area or storage space on a mezzanine level Ample exclusive use car spaces provided on site including some covered bays Available immediately call to arrange an inspection today! Lease Price: $313,760pa + Outgoings + GST ( approx) Contact marketing Agents Jared Doyle or Jack Gwyn of Ray White Commercial TradeCoast to arrange an inspection. 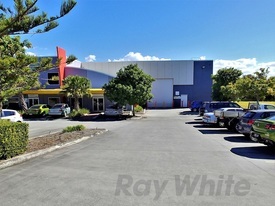 756sqm TradeCoast office/ warehouse across two tenancies 188sqm first floor office 568sqm warehouse Fantastic natural light 3 phase power supply Dual wide electric container height roller doors Self contained amenities include a toilet and kitchenette Six (6) exclusive use car spaces provided plus visitor bays on site Easy truck access via huge concrete apron with dual crossovers Tenant signboard on Murarrie Road Complex located directly across the road from Murarrie Train Station Close proximity to the Gateway Motorway, Port of Brisbane, Brisbane Airport and the Brisbane CBD Available Now Call Joint Exclusive Agents to arrange an inspection today!! Lease Price: $116,405 p/a + Outgoings + GST ( approx.) For further information or to arrange an inspection please contact the Joint Exclusive Marketing Agents Jared Doyle or Jack Gwyn of Ray White Commercial TradeCoast! Options from 305sqm 452sqm 305sqm ground floor, open plan, a/c office/ showroom with one board room 147sqm warehouse 3 phase power Electric container height roller door Fibre optic internet connected to site Gated, secure site Amenities include a kitchenette, shower two toilets Located in the highly sought after Metroplex Estate walking distance to cafe/bistro 305sqm office: $61,000 p/a + Outgoings + GST 452sqm office/ warehouse: $80,000 p/a + Outgoings + GST ( approx.) For further information or to arrange an inspection please contact the marketing agents Jack Gwyn or Jared Doyle of Ray White Commercial TradeCoast! 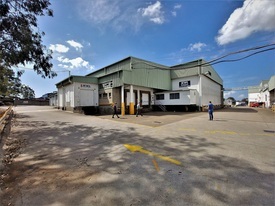 835sqm* - 10,548sqm* Tradecoast Distribution / Storage Facility From $70/sqm + Outgoings ..
835sqm 10,548sqm office/ warehouse Multiple office/warehouse tenancies available Ample 3 phase power Multiple container set down areas can be included Amenities with each tenancy Ample loading docks Arguably the best value in Murarrie Fantastic location being just 600m from the Gateway Motorway Port of Brisbane Motorway and just 150m from the Murarrie Train Station. Some combinations available include but are not limited to: Building B C 631sqm office/ amenities 9,917sqm warehouse 10,548sqm total 29 loading docks 1 on grade electric container height roller door 3 fork ramps Building B 481sqm office/ amenities 6,419sqm warehouse 6,900sqm total 20 loading docks 1 on grade electric container height roller door 2 fork ramps Building C 150sqm office/ amenities 3,498sqm warehouse 3,648sqm total 9 loading docks 1 fork ramp B1 B 4 148sqm office/ amenities 2,152sqm warehouse 2,300sqm total GLA 1,064sqm hardstand 9 loading docks 1 fork ramps B2 B3 333sqm office 4,267sqm warehouse 4,600sqm total 11 loading docks 1 on grade electric container height roller door 1 fork ramps B1 28sqm office 1,199sqm warehouse 1,227sqm total 3 loading docks 1 fork ramp B2 84sqm office 2,185sqm warehouse 2,269sqm total 2 loading docks 1 on grade electric container height roller door B3 249sqm office 2,082sqm warehouse 2,331sqm total 9 loading docks 1 fork ramp B4 120sqm office 953sqm warehouse 1,073sqm total GLA 1,064sqm hardstand 6 loading docks ( approx.) For further information or to arrange an inspection please contact the exclusive marketing agents from Colliers International or Ray White Commercial TradeCoast.